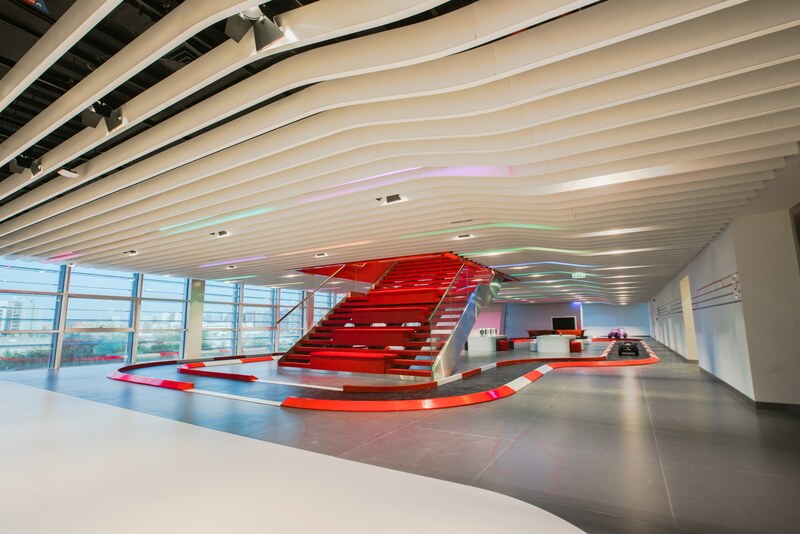 This week’s instalment of the #SBIDinspire series features the cutting-edge and futuristic flagship showroom dubbed ‘The Wave’ for Toyota in Abu Dhabi. Al-Futtaim Motors is the exclusive distributor of Toyota in the UAE. 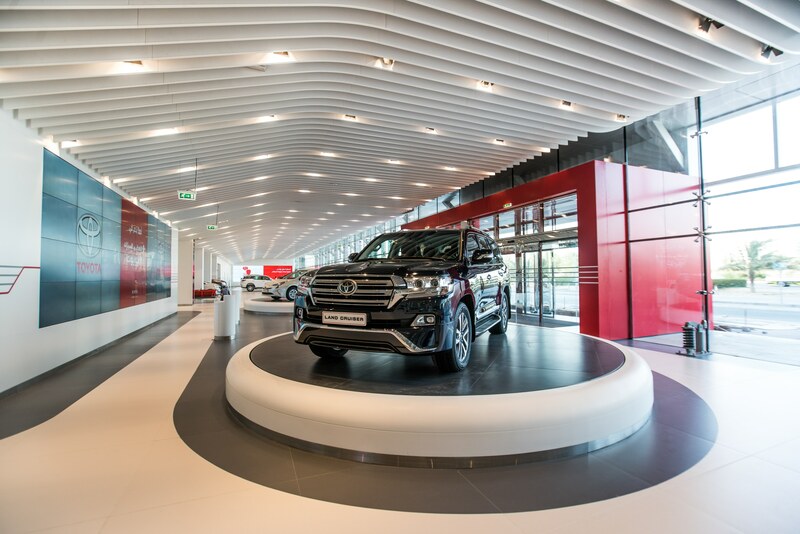 Following its acquisition of ‘The Wave’ building, design consultancy Greenspace, was commissioned to create a contemporary and unique flagship and redefine the standards for retail and brand experience for Toyota. The Wave is set over five floors of 14,000 m2 of retail and service space. The challenge for Greenspace was to plan the circulation throughout the buildings and differentiate sales, display, hospitality and interaction zones. The interior design vision from the outset was to provide a modern and minimal aesthetic achieved by using undulating fins with inset premium lighting above smooth, white and grey ceramic flooring slabs. Greenspace also included a family zone, complete with racetrack and drivable electric cars, travelator tunnel to join the buildings and a digital design studio area. SBID had the opportunity to speak with Adrian Caddy, CEO & Founder at Greenspace. Based on Toyota and Al-Futtaim Motors’ shared brand vision, ‘Passion for Better’ was the creative inspiration for all the architectural and interiors, lighting, digital and experiential design development undertaken by Greenspace. “We wanted the entire space to feel as if has been constructed from light waves, drawing the intensity of the exterior light through the building via the horizontal light contours on every floor.” — Adrian Caddy. The signature style of the entire interior space uses simple, mathematical lines and radiuses. The curved lines of the Wave exterior are echoed along the length of each floor by suspended white fins that are contoured from the front to the back of each floor. Planning, designing and installing a completely new circulation system to enable high numbers of visitors, as well as the cars themselves, to move easily around a 9,500m2 retail space was the biggest challenge Greenspace faced. 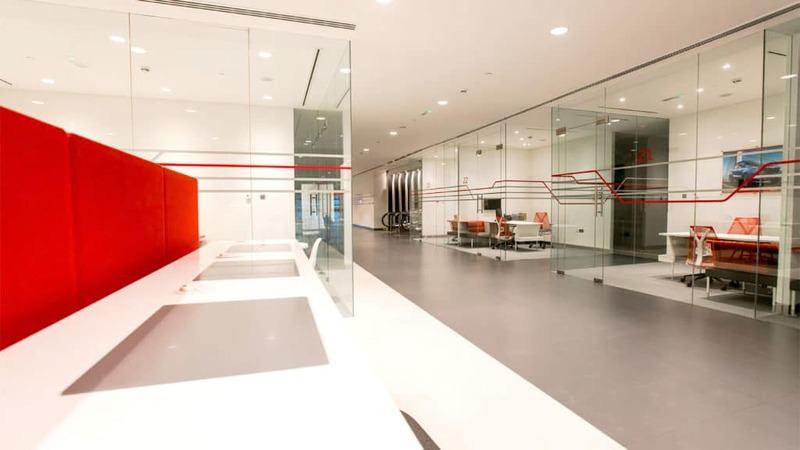 “The needs of all types of customers were considered in great detail through the customer journey planning workshops and the outputs fully informed the interior architecture and experience design process and their subsequent implementation” — Adrian Caddy. Greenspace designed the architectural interiors following rigorous circulation and customer journey planning, the results of which led to the construction of 2 new escalator cores, a vehicle elevator, and a 50m covered bridge incorporating moving walkways that spans the retail showroom and the service centre workshops. The new escalators, moving walkways and lifts enable customers to explore the giant flagship with ease. Probably the greatest acheivement of the project is that fact that the Wave retail flagship experience is augmented by digital screens on each floor, providing customers with information and interactivity through multiple touch points. “We decided very early on to eliminate displays of printed brochures and other forms of traditional point of sale, in favour of a seamless digital experience guided by hosts in the service of customers.” — Adrian Caddy. The entire customer experience was designed to be paperless, and instead, utilising digital technology to engage and inform visitors seamlessly. We were attracted to the SBID International Design Awards because of the recognition they provide to design excellence across diverse sectors and because they have the ability to attract international attention. 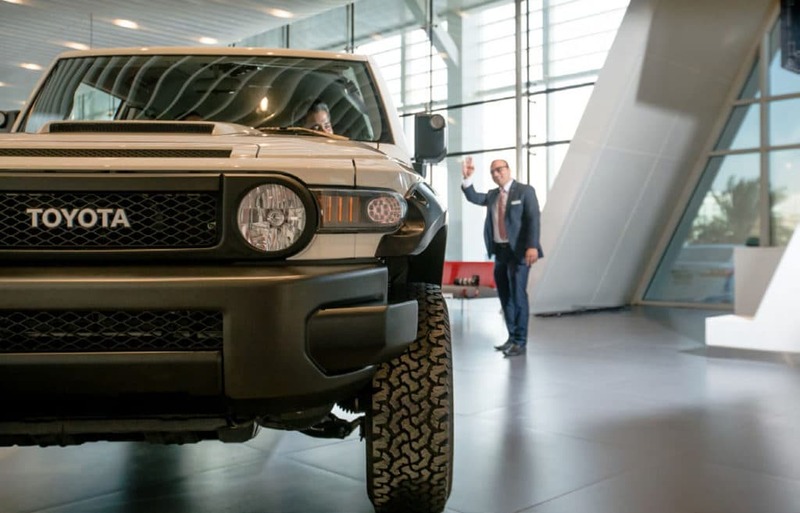 “As a London-based company with a specialist reputation, we were delighted to create the new Toyota retail flagship experience in Abu Dhabi. This is a unique project with real ambition that will create a powerful legacy for all involved. To win an SBID International Design Award would be a great honour to all involved.” — Adrian Caddy.